We've worked with our friends at the Raleigh companies Kung Fu Nation and Tannis Root—responsible for shirts and hats and all sorts of things from some of our favorite rock bands—to create T-shirts for Welcome to Raleigh, Y'all and Come Out & Show Them at large. 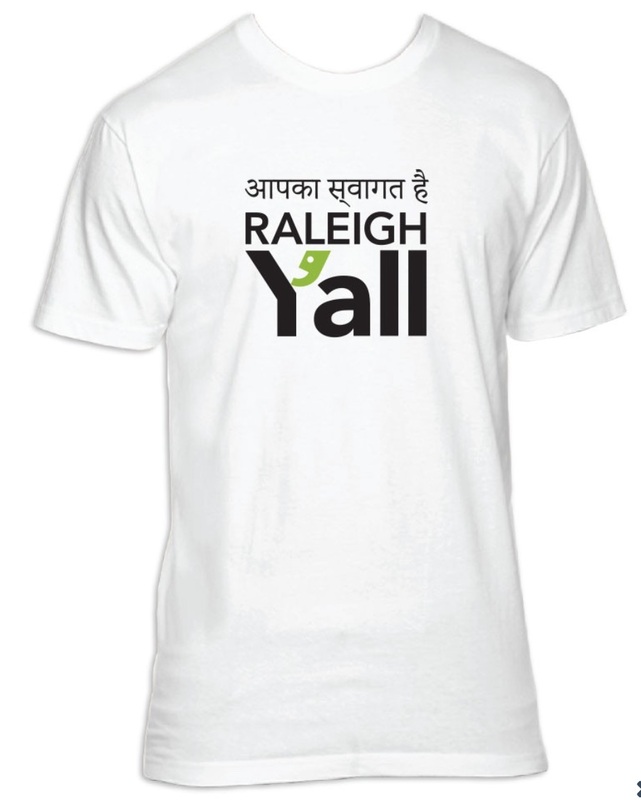 We've made Welcome to Raleigh, Y'all shirts in four languages—Spanish, Hebrew, Hindi, and Arabic. If you'd like to see a specific language on a T-shirt, email us, and we'll add a vote for it on the list of possibilities. And yes, we're considering Welcome to Durham, Y'all shirts, too! Proceeds from T-shirt sales go to the Welcome to Raleigh, Y'all campaign, which funds the local chapter of the United States Committee for Refugees and Immigrants, Uniting NC, and the operation of Come Out & Show Them. Looking to buy Welcome to Raleigh, Y'all signs and stickers? Here!